Waist-high brooms, their handles just a couple feet long, hang on the classroom wall beside dustpans and wash basins. Step stools line the mini-kitchen cabinets and child-height sinks. Green drinking glasses sit stacked on shelves alongside sets of tiny tables and chairs. Beverley Wolff, head of the Montessori School of Pullman, says many young students enjoy the "practical areas" of the classroom where they can work on household tasks like sweeping or preparing snacks. "They love to help the teachers wash the tables," she says. "They love to load the dishwasher." Long established as part of the Montessori Method, research suggests helping with chores provides numerous benefits to a child's development, prosocial behaviors and overall lifetime success. Kids feel more included and empowered. They show greater empathy and executive function. And the sooner they start, the better. Young children want to emulate what they see adults doing, Wolff says, making the ages between 2 and 6 an ideal time to instill positive habits around household chores. At the school, students will help clean up after activities, assist with weekly classroom maintenance and handle much of the food prep for snacks. "They're practical skills," she says. "It helps build ownership and pride in the classroom." Many parents struggle to enforce chores while balancing extracurricular activities, playdates, piano lessons and other obligations. Some parents feel like kids should just be kids. Others do not think they can sacrifice the time to guide children through tasks or re-do them later. Research indicates it is definitely worth the effort. A 2018 study of almost 10,000 children in the Journal of Developmental & Behavioral Pediatrics found that helping with chores showed a positive association with higher academic performance, competence and satisfaction. Marilyn Rossman, a retired professor of family education at the University of Minnesota, analyzed a 25-year longitudinal study to find that children who helped with chores were more likely to be successful adults. The small study tracked 84 individuals from age 3-4 to their mid-20s. "It really matters to start children young," she says. Children who started helping the family with chores as preschoolers had better outcomes than children who started later. Rossman says parents reported improved self-reliance, problem-solving, ability to understand obligations and consequences, organizational skills and self-esteem. Despite the many benefits, Rossman warned that suddenly starting teens on chores had a tendency to backfire. Some 15-16 year olds became "belligerent" when asked to take on responsibilities they had come to expect their parents to do. They resented having to step up and did not fare as well by their mid-20s. Some modern parents, she says, spend too much time trying to be liked by their children and not enough time preparing them for life's challenges. "Parents have become afraid of confronting their children," she says. "I don't think parents are willing to push their children until a task is accomplished." 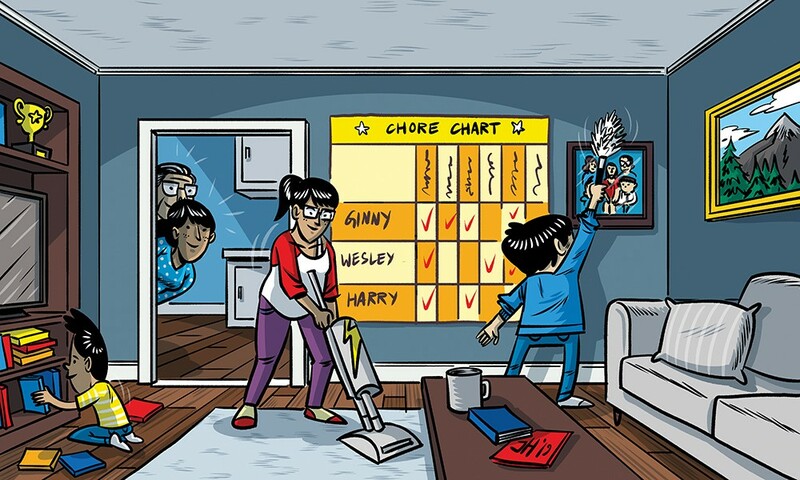 Competing priorities with school, social lives or screen time can make it harder to establish routine chores, but Rossman says setting aside time for chores is an investment in the family's shared goals and well-being. Rossman recommends starting children with age-appropriate tasks that they can easily master. Parents should work alongside kids at first and then hand over more control of the task to the children. Keep the praise high and the stakes low. Avoid teaching new tasks when time is a factor. "You really need to make it kind of fun at the beginning," she says. "It's not going to be done well. ... You're going to think it's not worth it." Rossman and others advise against tying allowance or other rewards to regular household chores. The motivation can wear off quickly and build in expectations that they should be paid for pulling their weight. Laylah Sullivan has two children, ages 5 and 7, attending the Montessori school in Pullman. While she acknowledges resenting some chores as a kid, she says it's important that children learn to contribute and challenge themselves and practice new skills. Starting young seems to help. "It's just part of what they do," she says. "They don't see it as a chore." As a high school teacher, Sullivan says she sees teenagers who struggle with minor tasks or lack the confidence to solve simple problems. She appreciates that the Montessori program sets high expectations for kids and promotes a sense of shared responsibility. "It helps them be good citizens," she says. In the hallway outside the Montessori classroom, children sing as they march to recess. Wolff says those children will take the skills they learn now with them as they become adults. They will know how to sort laundry and cook dinner and manage a household. Children will carry that capability over to other aspects of their lives. "They're good at doing things," she says. "That comes from being trusted to do it when you're young." The original print version of this article was headlined "Pitching In"